On the grounds of 17th century Barrington Hall is a semi-permanent marquee used to host weddings, corporate events and an array of other special occasions and thanks to Sound Ceilings UK it is also sound-proof. 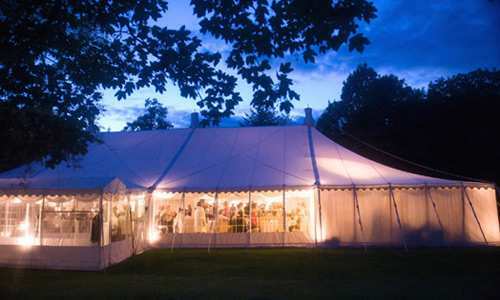 Situated in the heart of quiet quintessentially English village Barrington the picturesque scenery means that a marquee spilling noise was not an option. Environmental Health had began to apply pressure leaving the owners not knowing what options they had. Having battled with the problem for a while, an introduction to Sound Ceilings UK via Techtonics couldn’t have come at a better time. Since the original consultation both Sound Ceilings UK and Barrington Hall have worked together to reach the ultimate solution for a problem marquee owners all over the country are suffering. In the case of traditional pole marquees there are two options in regards to installing, either utillising a free standing tri-truss frame or rigging directly onto a central pole. From the tri-truss frame erected at Barrington Hall we hung the aluminum grid which is used to house the Sound Ceiling tiles. In addition to the 32 tiles, provding in excess of 98dB a racking unit contains all amplification, processors set up by our sound team. For more information, contact Soundceilings UK on +44 (0) 1889 576358.